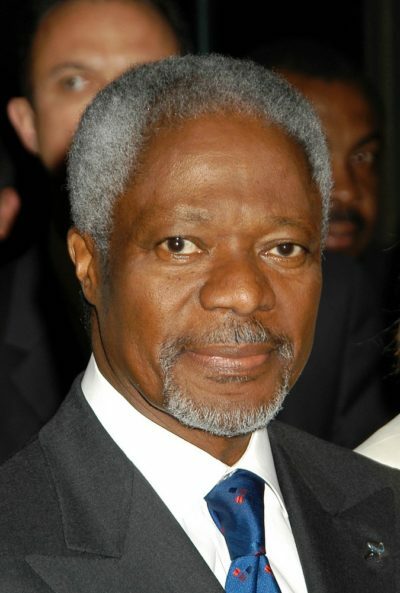 Kofi Annan was a Ghanaian diplomat. He served as the 7th Secretary-General of the United Nations, from 1 January, 1997 to 31 December, 2006, and as the United Nations and Arab League Envoy to Syria, from 23 February, 2012 to 31 August, 2012. His father, Henry Reginald Annan, was of half Ashanti and half Fante descent, and had served as the governor of Ashanti. His mother, Rose Victoria Eshun, was ethnic Fante. Kofi was married to Swedish lawyer Nane Maria Lagergren, until his death. He has two children with his former wife, Titi Alakija, a Nigerian woman from an aristocratic family. Kofi’s paternal grandfather was Thomas Kwesi Nyan Annan (the son of Kofi Annan and Adwoa Fie). Thomas was born in Kakomdo (Ebubonku), Central Region. Kofi’s paternal grandmother was named Mary Brown. Mary was born in Amissano, Central Region. Correction: Victoria was ethnic Fante, not Ashanti.